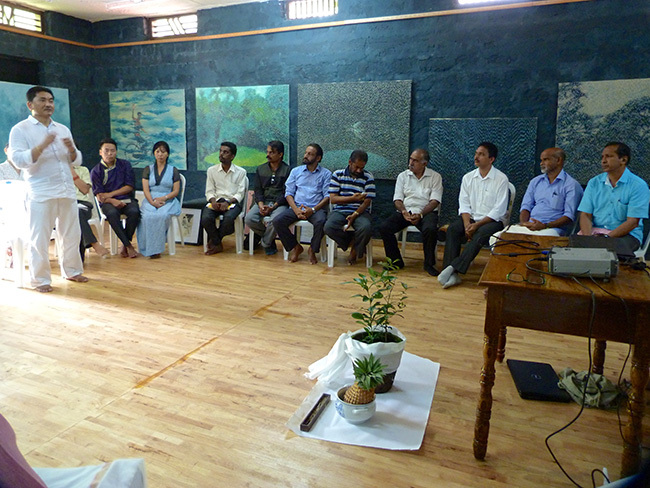 During the concluding days of the 46th Wellbeing Camp in September 2015, Fr Nelson Thyparambil visited and spoke about Laudato Si' and how he wished to conduct a discussion on environmental degradation. 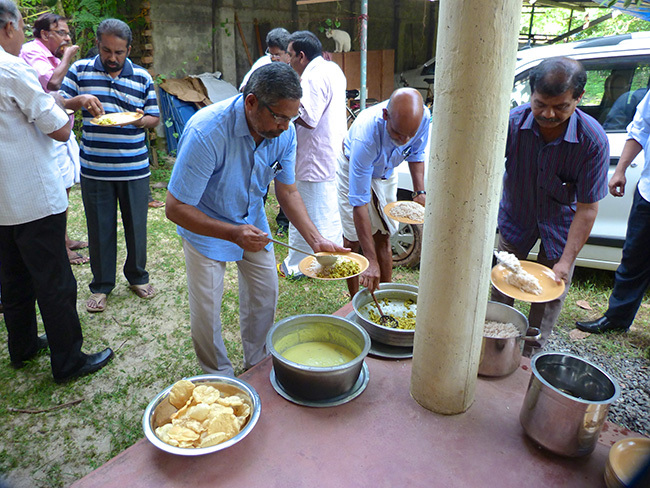 He expressed interest in conducting the discussion at Centre for Social and Political Arts (CSPA), Sylviander House, Alappuzha during Wellbeing Tibetan Medical Camp, so that we could discuss the larger issue of environment and wellbeing. A beautiful morning welcomed us on November 7, 2015. The 47th Wellbeing Tibetan Medical Camp had concluded a day earlier. It was nice to see the 30 delegates arriving at 9.30am. In our guestroom, Sylvie Bantle and I were downloading information about Water Crystal and Dr Emotos. At 10 am, the Discussion on Laudato Si' and Tibet's Environment organised by Institute of Coastal Research and Development (ICRAD) and supported by Friends of Tibet and Sylviander House Art Museum started. The 30 delegates, experts, observers from different walks of life assembled in the Gallery Hall. The chairs were arranged in a circular fashion denoting the circle of life. 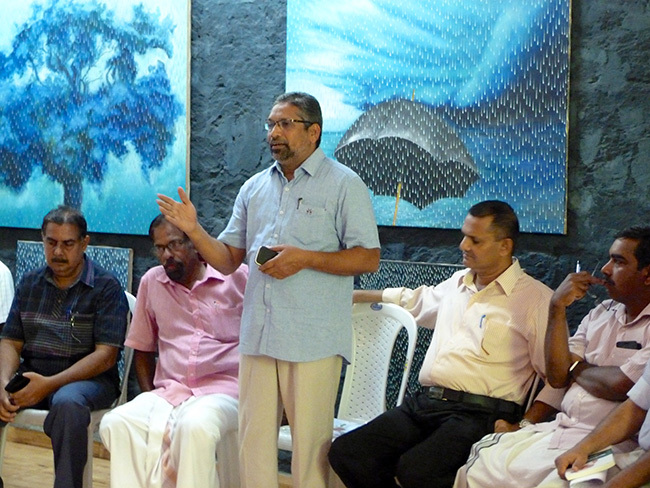 Fr Nelson Thyparambil shared the agenda for the day and introduced the various speakers and fellow delegates. Sylvie welcomed the gathering and spoke at length about how it's important to come to dialogue with our surroundings. How it's important to be connected with the soul. She emphasised how destruction of nature is a modern phenomenon. She compared the present day crisis in Kerala to what happened in Germany much earlier. We have advanced in terms of machineries and equipment's we use, but we have distanced ourselves from nature. Sylvie felt the first step is understanding and renewing connection to our soul. This is something which we had in the past but over a period of time, have destroyed our inner voice. She emphasised how the clear looking water provided by the local bodies are chemically treated and how the excessive fluoride and chlorine harms our health. Our communication with nature should be similar to how a mother communicates to her baby child. Kavalam Balachandran, noted Malayalam poet and critic introduced Laudato Si' and how His Holiness Pope Francis expressed his views on environment in the book. Caring about nature and environment is everyone's duty. The book is deep and truthful in its analysis. Mankind is lowering stature by not caring nature. Birds and worms are important for agriculture. Massive destruction of water bodies and polluting them causes issue to the common man who cannot afford bottled water. The money wasted on luxuries of life, and in destruction of nature is in actual snatched from the poor sections of the society. The cruelty towards animals that we do now may in future be extended towards harming fellow human beings! Though mankind is the last to appear in the face of earth, over the period of time, we have considered ourselves to be superior and sole owners of this universe causing maximum destruction and harm to fellow living beings! 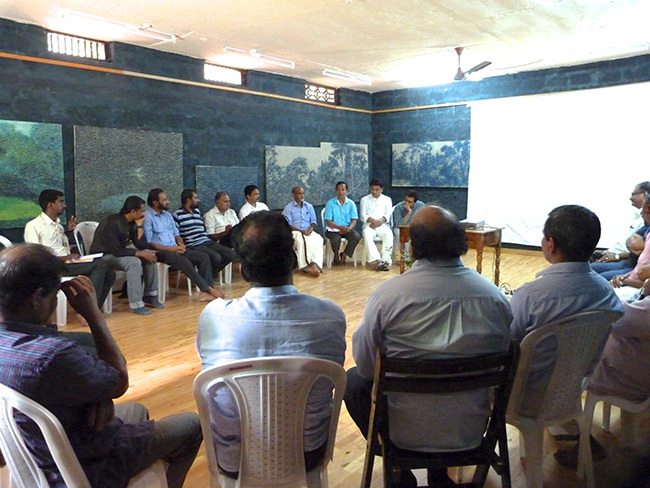 What followed was a discussion on the stray dog issue. How the root cause of the problem is disowning pets and our irresponsible attitude in doing so. Emphasis was how one should exercise free will with responsibility. There was also a discussion on how Made in China products have caused harm to the strata of the society and how the easily available and affordable products are in fact harming the environment in a larger sense. Eswar Anandan dedicated his poem 'A Paradise Named Tibet' to the gathering. He described how His Holiness the XIV Dalai Lama had told it's our responsibility to take care of our environment for our future generation. Dr Dorjee Rapten Neshar emphasised on the importance of five elements in our life. He explained how suffering is created by human beings because of our misconduct and exploitation of nature. We forget that we are just a part of universe and we do not control it, rather the universe controls us, the five Cosmo physical elements control us. Our body is a miniature of our universe, if we really care about our body, then we should care for environment, because without the healthiness of the environment, we cannot achieve healthy living. He emphasised how our respect for the environment is declining, and how we have become more happy serving ourselves! He cited medical texts which prophesised the change in nature of human beings and how it said that 1/4th of population would be destroyed because of epidemics. He related the situation in Tibet where for ages Mother Nature was worshipped. The nation which is abundant in natural resources, the hills rich in metals were never destroyed, because they felt destroying them would amount to destroying themselves! The Tibetans believed in collective fortune, not individual fortune. Unfortunately after the Chinese illegal occupation of Tibet, the situation is changing. Chinese with collaboration with a major mining force, in the last 20 years have cut all the trees in the mountains. His Holiness the XIV Dalai Lama compares the current scenario in Tibet to that of the monk's tonsured head. The thick forests are no more. The snow caps melting, causing more danger and destructions, but we are quiet, we are not taking responsibility. The five major rivers that originates from Tibet, is now controlled by China. The natural tributaries are being diverted. This is one of the main reasons for natural calamities like floods which India has constantly experienced in the North East the past couple of years. But we keep quiet! The other speakers spoke about the need to build houses that is environment friendly and how energy needs to be conserved. The discussion concluded with a presentation by Prof John Thomas. He spoke about pollution in the coastal belt. He showed how the once beautiful landscape and water bodies is now being filled with constructions, how the water channels are polluted with plastic and electronic waste and how the water has turned black over a period of time. 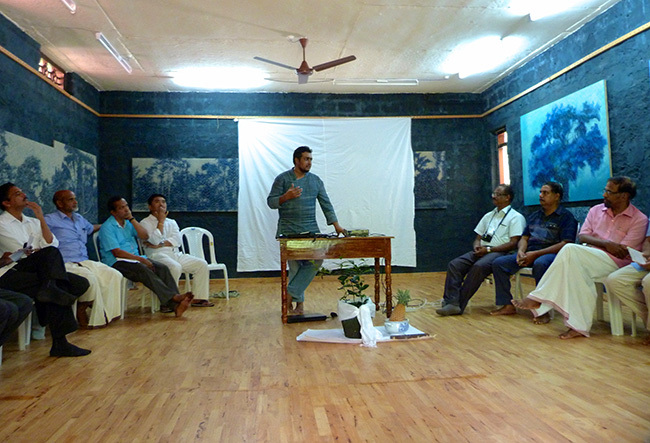 He spoke about how pollution is affecting the quality of water and explained the importance of mangroves. He shared how the excessive addition of chlorine and fluorides in drinking water causes dental disease. The participants were given a kit comprising of His Holiness Book on Environment, Seasons — Poetic Thoughts by Eswar Anandan, Friends of Tibet reading material on Tibet, Wellbeing pamphlet, Design & People Poster on Environment and Centre for Social and Political Arts card and print out of the poem — A Paradise Named Tibet.